Waste to energy gasification has proven to be a reliable and significant "wedge" for many organizations across the world. In fact, there are more than 272 operating gasification plants worldwide with 686 gasifiers. Several months ago, Aries Clean Energy surveyed hundreds of energy, waste, and sustainability professionals to find out where they go to get their professional news. The results were striking: GreenBiz, Sustainable Brands, and Environmental Leader were the clear winners or “go to” places for getting cutting edge news. Of those three main outlets for sustainability news, Environmental Leader is the one that also serves a news or headline outlet while GreenBiz and Sustainable Brands post more custom and editorial content. Quantity: many more companies are making announcements of sustainability progress, plans, and goals. Quality: the goals being set today are far more aggressive and extensive than the goals of a decade ago. Looking just at greenhouse emissions goals in 2007, only six companies announced goals that were 50% or more and zero companies announced a 100% emissions reduction or renewables goal. Fast forward just 10 years – and look at how much has changed. For greenhouse gas emissions, two of the leading organizations rallying companies together to embrace clean energy and reduce emissions are Science Based Targets and the RE100. A third great resource is PivotGoals.com, which tracks and posts the sustainability goals of the Global Fortune 250 companies. The Science Based Targets initiative is a collaboration between CDP, World Resources Institute (WRI), the World Wide Fund for Nature (WWF), and the United Nations Global Compact (UNGC) and one of the We Mean Business Coalition initiatives. RE100 is a collaborative, global initiative uniting more than 100 influential businesses committed to 100% renewable electricity, working to massively increase demand for – and delivery of – renewable energy. RE100 is led by The Climate Group in partnership with CDP. Science Based Targets: 310 companies have announced Science Based Targets, of which 73 companies have approved science-based targets. RE100: 111 companies have joined and committed to achieving 100% clean energy. 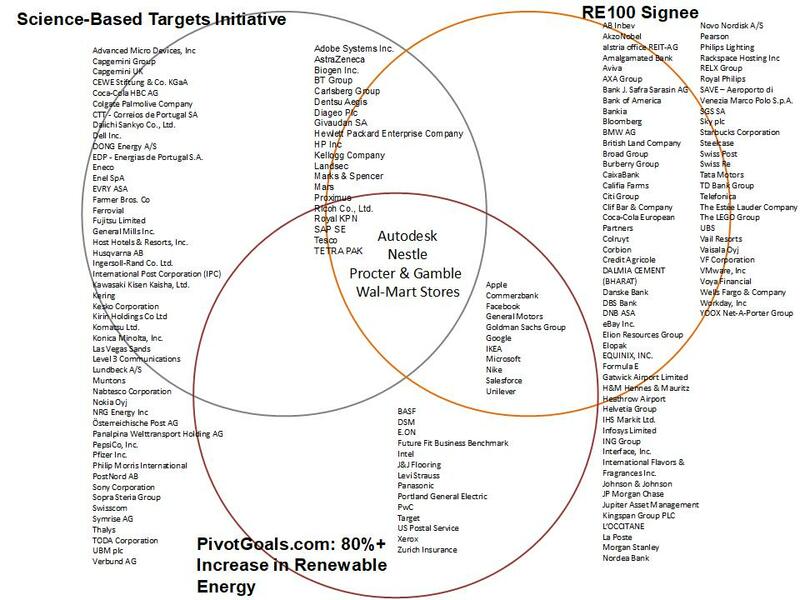 Pivot Goals: 32 companies in the Global Fortune 250 have set a renewables/clean energy goal of 80% or more. Summary: 36 companies have set more than one of the three goals highlighted above, with four companies (Autodesk, Nestle, Proctor & Gamble, Walmart) doing all three. The results are highlighted below in Figure 2. This is by no means a complete list of all of the companies engaged in deep and aggressive clean energy and emissions reduction goals. But it does give a high-level snapshot of the growth and action that has occurred over the past decade and, in particular, the past few years. As most of the leading companies know and communicate, no one solution will get them from their current state to reaching their goals. A common understanding is that a “wedge approach” is needed, i.e., finding solutions across many technologies and applications and not through one silver bullet. Waste-to-energy gasification has proven to be a reliable and significant “wedge” for many organizations across the world. In fact, there are more than 272 operating gasification plants worldwide with 686 gasifiers. And those numbers are growing, just like the number of companies setting emissions and clean energy goals.